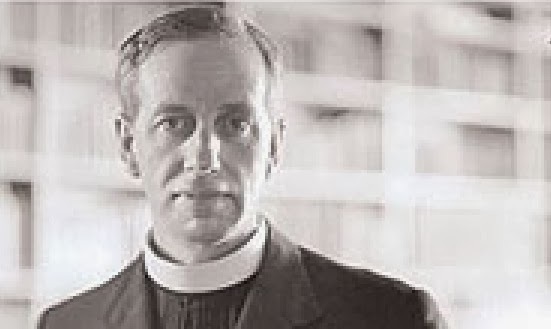 Ronald Knox (1888–1957), son of evangelical Bishop of Manchester, E.A. Knox, attended Eton College and won several scholarships at Balliol College, Oxford. In 1912 he was ordained to the priesthood in the Church of England and was appointed chaplain of Trinity College, Oxford. In 1917 he swam the Tiber, and the following year he was ordained in the Roman Catholic Church. Knox wrote many books of essays and novels. Singlehandedly he translated St Jerome's Latin Vulgate Bible into English. His works on religious themes include: Some Loose Stones (1913), Reunion All Round (1914), A Spiritual Aeneid (1918), The Belief of Catholics (1927), Caliban in Grub Street (1930), Heaven and Charing Cross (1935), Let Dons Delight (1939) and Captive Flames (1940). He was known for his ability as a communicator and had a witty turn of phrase. He was a regular broadcaster for BBC Radio. The following is just a "taster" from "The Priestly Life", retreat addresses to the clergy, published in 1958 on Go HERE for a pdf document of the whole collection. Deeply Scriptural, thought provoking, challenging and amusing, I recommend that you download the document. It will feed you for a while! If you read through the Hebrew prophets from end to end—not many people do—the last of them, Malachy, strikes you with a sense of homeliness, and almost of modernity. Partly because, except for one verse, his book is intelligible throughout. But partly because he does not share with his fellow-prophets their apparent indifference to all the externals of religion. Of course, we quite realize that the Jews under the Old Dispensation needed to be warned against merely external religion; for that matter, we need it ourselves. But the prophets seem so obsessed with it; look at the way in which Amos represents Almighty God as talking to his people. “Oh, but I am sick and tired of them, your solemn feasts; incense that goes up from your assemblies I can breathe no longer. Burnt-sacrifice still? Bloodless offerings still? Nay, I will have none of them; fat be the victims you slay in welcome, I care not. O to be rid of the singing, the harp’s music, that dins my ear!” Well, some of us aren’t too happy about our own choirs; and apart from that, we know that the Israelites of Amos’ time were worshipping Moloch on the side and oppressing the poor. But you can’t help feeling that a diocesan censor would have recommended the prophet to phrase it rather differently. With Malachy, you leave all that behind you. For him, there is one glaring reason why Almighty God is discontented with his people; it is because the priests are not doing their job. In particular, they are allowing people who offer sacrifice to bring the worst of their cattle with them instead of the best. At first sight, you would think that was the fault of the laity; after all, it was the priests had to eat what was left over.... But no, it was the priests’ job to teach people the law, which laid it down expressly that the victim of any statutory sacrifice must be a perfect animal, without blemish. And the priests weren’t doing that, apparently because they had come to treat the whole of the Temple worship with disdain. I suppose it was at the time when the people had just come back from exile, and were living in pre- fabricated buildings, and everything was rather utility; the temple itself, old people would tell you, was a very poor substitute for the old one. And in the general atmosphere of disillusionment, the priests had got disillusioned too; shrugged their shoulders and said well what could you expect. “You think to yourselves, The Lord’s table is desecrated now; it makes no matter what food lies there, what fire burns it. Weary work, say you, and dismiss it with a sigh. Cursed be the knavery that offers the Lord gelt beast, when there are vows a-paying, and all the while there is an entire beast left at home!